David was born of second generation Missionaries, in Mussoorie one of the 6 Hills Stations, tucked up against the panorama of the Himalayas in Northern India. He attributes these exotic beginnings as a catalyst for what was to become a very adventurous life. David feels strongly that all his experiences are somehow reflected in his work, much less his personality. 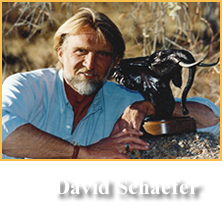 Those individuals, who have acquired Schaefer Sculptures, do so because they recognize the qualities of artistic integrity and meticulous workmanship. In the years to come the value of a “Schaefer” will further increase their worth to the collector.